Catastrophic failure of total hip arthroplasty due to severe component wear can drive to significant soft tissue metallosis, bone resorption and in some cases can be misdiagnosed as a dislocation. Department of Orthopaedics, School of Health Sciences, University of Thessaly, Greece. Introduction: Common causes of revision total hip arthroplasty (THA) are component wear, implant loosening, dislocation, and infection. 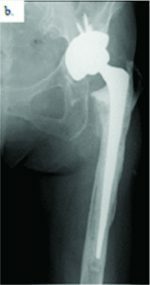 Case Report: An 84-year-old female patient is presented with an unusual pattern of hip dislocation due to structural failure of the cup construct and excessive component wear. Conclusion: Component wear of THA can drive to catastrophic failure of the implants and significant soft tissue metallosis. Early diagnosis allows interventions even in those hips that are asymptomatic. In the case of a THA dislocation, a thorough imaging control is necessary to reveal structural failure and avoid repetitive and aggressive manipulations for reduction. Keywords: Total hip arthroplasty, implant failure, polyethylene wear. 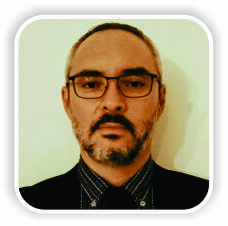 Since its introduction in the 1960s, total hip arthroplasty (THA) has proved to be an excellent and reliable treatment procedure for end stages of hip pathology, with satisfactory clinical outcomes at 15–20 years . However, despite successful outcomes, THA’s revision rates have grown steadily over the past years . Common causes of revision THA are component wear, implant loosening, dislocation, and infection. A thorough understanding of risk factors and reasons for failure helps surgeons to improve their THA outcomes. Alternative bearing surfaces have been developed to reduce the amount of wear particle production. Polyethylene (PE) has undergone various improvements, from the development of ultra-high-molecular-weight PE (UHMWPE) to cross-linked PE (XLPE). These improved PEs have shown better wear characteristics in combination with mainly metallic heads in vitro and in vivo . We report on an unusual pattern of hip dislocation due to structural failure of the cup construct. We believe this complication could have been prevented if the patient had followed our recommendation for early bearing surface exchange, based on observations from an in vivo long-term wear study conducted in our department. An 84-year-old female patient was admitted to the accident and emergency (AE) department of our hospital complaining of painful restriction of movement in the left hip for the past month. She had undergone a left cement less THA (reflection cup, synergy stem, 28 mm ceramic on XLPE bearing coupling, Smith and nephew, Memphis, Tennessee, USA), through an ordinary posterior approach, 14 years previously. The immediate post-operative period had been uneventful. In the 8th post-operative year, during a follow-up evaluation, the patient was found to be asymptomatic, but signs of PE wear were recorded on radiological evaluation. The patient was advised, by her surgeon, to attend outpatient clinics at regular intervals and she was informed about the possibility of an early revision of the bearing surface. Despite this, she failed to attend any other appointments. On admission to the AE, the patient reported that she had experienced increasing restriction of movement and functional impairment during the previous year without having sustained a recent hip injury. On clinical examination, painful restriction of movement, no signs of soft tissue injury or infection, and a leg length discrepancy of 4 cm were recorded. Laboratory blood workout was found to be normal. On radiological examination, a left THA dislocation was found (Fig. 1) and the patient underwent three unsuccessful attempts at closed reduction, under anesthesia, in the AE department. During these attempts, the patient sustained an undisplaced fracture of the neck of ipsilateral fibular head.The following day, during an open reduction under anesthesia in the operating theater, a central dislocation of the head of the prosthesis was found. The PE liner was found to be worn and broken, and the ceramic head had centrally perforated the metallic acetabular shell and was located behind the shell in an osteolytic area full of PE and metallic debris. Excessive soft tissue metallosis was also found. The femoral stem and the perforated metallic shell were found to be stable. A thorough soft tissue debridement was performed, the retro-acetabular bone defect was filled with cement and a PE liner was cemented into the damaged metallic shell (Fig. 2). The prosthesis was then reduced and evaluated for stability using a 32 mm ceramic head. 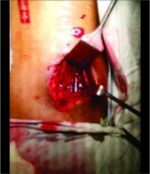 The patient experienced an uneventful post-operative clinical and functional recovery. It is accepted that long-term survival of a THA is a multi-factorial issue with the implant, diagnosis, patient, surgeon, and surgical technique being equally important. Wear debris production from the bearing surfaces leads to the development of interface osteolysis which, these days, is thought to be the main factor limiting long-term survival of the artificial joint . Alternative bearing surfaces have thus been developed to reduce the amount of wear particles produced . Hard on soft bearing surfaces have been used on the majority of patients and this combination is preferred by many surgeons, but it is associated with wear and osteolysis . Metallic femoral head on PE, introduced by Sir John Charnley, is the “gold standard;” however, ceramic head on PE (introduced in the early 1970s) demonstrated, in hip simulators, up to 20 times less wear than Charnley’s combination, which does, however, show a relatively low risk of fracture. PE, moreover, has undergone many improvements, from the development of UHMWPE – conventional PE (CPE) to cross-linked (XLPE) PE. These improved PEs have shown better wear characteristics in combination with mainly metallic heads in vitro and in vivo [7, 8, 9]. Despite these improvements, severe wear of PE liners is still recorded, even in cross-linked liners. In some cases, PE liner structural failures and dislocations from the metallic shell are found. Such PE liner failures allow friction between the head of the femoral component and the metallic acetabular shell. This can erode the dome of the metallic cup leading to a THA “protrusio acetabula.”In case of metallic implant erosion, excessive production of metallic debris induces a periarticular soft tissue reaction and metallosis which enlarges the outer border of the articular cavity and creates the radiological finding of “bubble sign” . Dislocation is a difficult problem for both patient and surgeon. The true incidence of post-operative dislocation varies depending on surgical, patient, and implant factors (0.3–3%) . Most dislocations occur in the immediate post-operative period (30–60%). Patient risk factors include previous surgery, neuromuscular disorders, dementia, female gender, inability to comply with activity restrictions, and alcohol abuse. Avascular necrosis, congenital hip disease, and THA performed for hip fractures, and revision surgery are also predisposing factors . Surgical factors related to dislocation include component positioning, failure to restore leg length or offset, abductor mechanism and capsule insufficiency, and posterior approach . Component positioning within the safe zone is important (combined anteversion being more important); however, other factors such as pelvic inclination and obliquity are equally important . Factors (implant related) that decrease head to neck ratio increase the risk of dislocation. Larger heads with modern necks improve head to neck ratio, increase jump distance, reduce component impingement and increase the range of motion. When the implant neck impinges against an osteophyte, scar tissue, liner, cement, or heterotopic ossification, there is a risk of dislocation . The etiology of late instability is often multifactorial including PE wear, long standing malposition of the components, trauma, and neurological, and abductor muscle dysfunction . A prospective randomized study was conducted in our department to evaluate the clinical, radio-logical and in vivo wear performance of oxidized zirconium head on XLPE (Oxinium™- Smith and Nephew, Memphis, Tennessee, USA)  in THA, compared to other conventional bearing surfaces such as ceramic (Biolox® forte, Ceramtec) on either XLPE or CPE . In all patients, the synergy cement less femoral stem and the reflexion cement less acetabular cup (Smith and Ne-phew, Memphis, Tennessee, USA) with the above-mentioned bearing coupling combinations were used. The oxinium on XLPE bearings showed satisfactory wear characteristics at 10-year follow-up. However, two asymptomatic hips, one in the ceramic on CPE and one in the ceramic on XLPE bearing groups showed above average wear rates and since they were closely observed, and patients were informed about possible future revision surgery . The patient presented here, belonging to the ceramic on XLPE bearing group did not follow our instruction and 14 years postoperatively appeared in our AE department with this unusual central dislocation due to severe PE wear and perforation of the metallic shell. Several mistakes were made in managing this case. The pre-operative radiological examination was inadequate. A single anteroposterior pelvic radiograph of hip and pelvis is not enough for a safe estimation of the direction of the dislocation. Despite the fact that the vast majority of post-operative dislocations occur posteriorly, other displacements are also reported . In such cases of unknown or misdiagnosed dislocation displacement, orthopedic surgeons may attempt to reduce it by repetitive and aggressive manipulations which can cause various injuries of the sur-rounding soft tissues and/or periprosthetic fractures. Moreover, in the case of PE liner damage or dislocation, the satisfactory reduction is far more difficult. We suggest the performance of a computed tomography-scan in all cases of late THA dislocations before reduction is attempted, to appropriately diagnose the exact reason and the direction for the dislocation. The performance of lateral and oblique radiographs is not advised due to technical difficulties (painful restriction of hip movement) and the limited information they provide. The second mistake was the forceful attempts at reduction which caused the undisplaced fibular fracture. We suggest that if the dislocation is not easily reduced in a closed manner, further investigation is needed, and the dislocation should be openly reduced in the operating theater. It is important to stress that signs of metallic debris and the bubble sign were apparent in the initial radiograph despite its bad quality. Such radiological findings (bubble sign) are present in excessive metallosis due to a severe implant failure (often called “catastrophic failure”) indicating a more complicated situation than a posterior dislocation. Either due to the busy and stressful AE department environment or due to lack of knowledge, these signs were overlooked. Another contributing factor was the fact that the patient did not follow our advice for regular observation and possible early revision of her asymptomatic THA. Thorough counseling of all patients undergoing total joint arthroplasties is needed, informing them about the necessity of follow-up evaluations and, in the case of early findings, for early interventions even in those hips that are asymptomatic. Component wear of THA can drive to catastrophic failure of the implants and significant soft tissue metallosis. Early diagnosis allows interventions even in those hips that are asymptomatic. In the case of a THA dislocation, a thorough imaging control is necessary to reveal structural failure and avoid repetitive and aggressive manipulations for reduction. Long-term catastrophic failure of THA due to component wear is a complex and demanding orthopaedic problem with an increasing incidence. 1. Morshed S, Bozic KJ, Ries MD, Malchau H, Colford JM Jr. Comparison of cemented and uncemented fixation in total hip replacement: A meta-analysis. Acta Orthop2007;78:315-26. 2. Kurtz S, Ong K, Lau E, Mowat F, Halpern M. Projections of primary and revision hip and knee arthroplasty in the united states from 2005 to 2030. J Bone Joint Surg Am 2007;89:780-5. 3. Digas G, Kärrholm J, Thanner J, Malchau H, Herberts P. The ottoaufranc award. Highly cross-linked polyethylene in total hip arthroplasty: Randomized evaluation of penetration rate in cemented and uncemented sockets using radiostereometric analysis. Clin OrthopRelat Res 2004;429:6-16. 4. Schmalzried TP, Jasty M, Harris WH. Periprosthetic bone loss in total hip arthroplasty. Polyethylene wear debris and the concept of the effective joint space. J Bone Joint Surg Am 1992;74:849-63. 5. Mu Z, Tian J, Wu T, Yang J, Pei F. A systematic review of radiological outcomes of highly cross-linked polyethylene versus conventional polyethylene in total hip arthroplasty. Int Orthop2009;33:599-604. 6. Jasty MJ, Floyd WE 3rd, Schiller AL, Goldring SR, Harris WH. Localized osteolysis in stable, non-septic total hip replacement. J Bone Joint Surg Am 1986;68:912-9. 7. Muratoglu OK, Greenbaum ES, Bragdon CR, Jasty M, Freiberg AA, Harris WH, et al. Surface analysis of early retrieved acetabular polyethylene liners: A comparison of conventional and highly crosslinked polyethylenes. J Arthroplasty 2004;19:68-77. 8. BeksaçB, Salas A, González Della Valle A, Salvati EA. Wear is reduced in THA performed with highly cross-linked polyethylene. Clin OrthopRelat Res 2009;467:1765-72. 9. Glyn-Jones S, Isaac S, Hauptfleisch J, McLardy-Smith P, Murray DW, Gill HS, et al. 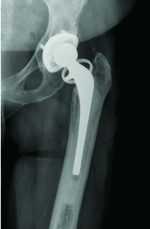 Does highly cross-linked polyethylene wear less than conventional polyethylene in total hip arthroplasty? A double-blind, randomized, and controlled trial using roentgen stereophotogram-metric analysis. J Arthroplasty 2008;23:337-43. 10. Su EP, Callander PW, Salvati EA. 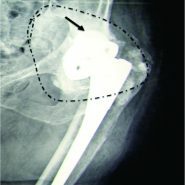 The bubble sign: A new radiographic sign in total hip arthroplasty. J Arthroplasty 2003;18:110-2. 11. Ullmark G. The unstable total hip arthroplasty. EFORT Open Rev 2016;1:83-8. 12. Seagrave KG, Troelsen A, Malchau H, Husted H, Gromov K. Acetabular cup position and risk of dislocation in primary total hip arthroplasty. Acta Orthop2017;88:10-7. 13. Pulido L, Restrepo C, Parvizi J. 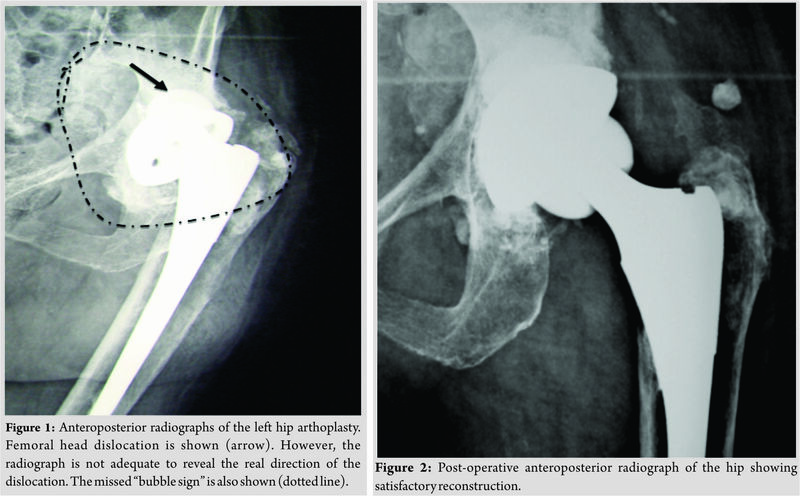 Late instability following total hip arthroplasty. Clin Med Res 2007;5:139-42. 14. Garvin KL, Hartman CW, Mangla J, Murdoch N, Martell JM. Wear analysis in THA utilizing oxidized zirconium and crosslinked polyethylene. 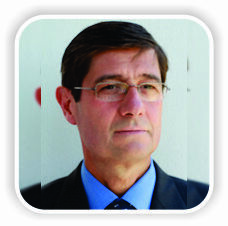 Clin OrthopRelat Res 2009;467:141-5. 15. Karidakis GK, Karachalios T. Oxidized zirconium head on crosslinked polyethylene liner in total hip arthroplasty: A 7- to 12-year in vivo comparative wear study. Clin OrthopRelat Res 2015;473:3836-45. 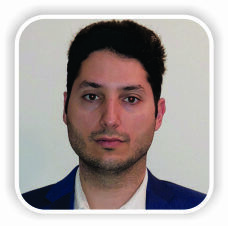 How to Cite This Article: Athanaselis E, Komnos G, Karachalios T. An Unusual Central Dislocation of a Total Hip Arthroplasty Due to Severe Wear of a Ceramic on Cross-linkedPolyethylene Bearing Coupling – A Case Report. Journal of Orthopaedic Case Reports 2018 Nov-Dec; 8(6): 54-57.